At least two dozen people keep watch outside a Portland mosque during Friday afternoon prayers. 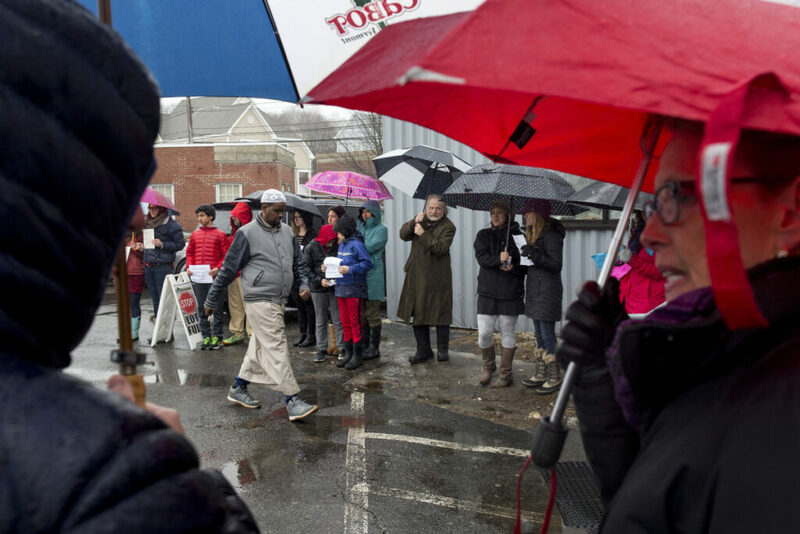 Worshippers headed into Friday prayers at the Maine Muslim Community Center in Portland were greeted by at least two dozen people standing outside to show solidarity a week after a dozens were killed in an attack on two New Zealand mosques. Wendy Chapkis, a Portland resident and University of Southern Maine professor, said she organized the event in the aftermath of an attack by a white supremacist gunman on two mosques in Christchurch, New Zealand, that killed 50 people and wounded at least 50 more. “I had been feeling quite eager to do something in the face of that violence,” Chapkis said. She was inspired by a man in Manchester, England, who stood outside a mosque there the day after the Christchurch attack with a sign that read “You are my friends. I will keep watch while you pray,” she said. Chapkis organized the event on Facebook and was prepared to be the only person there. Instead, a crowd of at least 25 people showed up to stand outside in the rain or crowd into the building entryway. “It was packed,” she said. The Christchurch attack follows deadly shootings at houses of prayer carried out by white supremacists, including massacres at a Sikh temple in Oak Creek, Wisconsin, in 2012 that killed six people, at Emanuel African Methodist Episcopal Church in Charleston, South Carolina in 2015 that killed nine people and the attack last October on the Tree of Life Synagogue in Pittsburgh that killed 11 people. “I think people are very alarmed, it has been a very disturbing trend to see people killed in their houses of worship,” Chapkis said. When prayers ended Friday, nearly 40 community members met with Portland Mayor Ethan Strimling and interim Police Chief Vern Malloch to talk about mosque safety. “We want to prevent another New Zealand,” said Gouled Hussein, who helped moderate the discussion. The city leaders pledged their support to the Muslim community. Malloch said he is working to convene representatives from every house of worship in Portland next week to talk about best practices for safety. “Every house of worship worries about this same thing, and I think we need to come together as a group and recognize that commonality,” the chief said. Staff Writer Megan Gray and Staff Photographer Brianna Soukup contributed to this report.